Members of the 50th Anniversary Class at their reunion dinner Friday night, September 22. 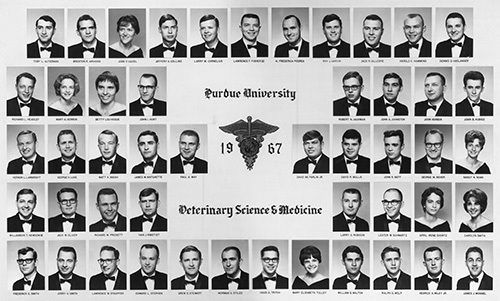 Members of Purdue Veterinary Medicine's fifth class to reach its Golden Anniversary, the DVM Class of 1967, received special recognition Friday, September 22, when they gathered at Mountain Jacks Steakhouse for their class reunion dinner. The evening began with a reception and entertainment by the Purdue Musical Organization's Lonely Hearts performing group. 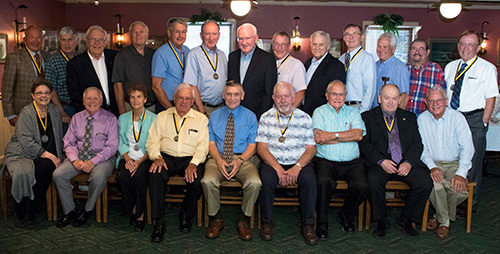 Dinner was followed by an opportunity for class members to share their recollections of memories from times at Purdue and their life experiences that have transpired over the 50 years since their class graduated. Earlier in the day, class members had a chance to gather at Lynn Hall and don white coats for nostalgia's sake before taking tours led by students in the DVM Class of 2018. Afterward, the 50th reunion class convened for lunch to hear about the College's plans for new facilities in the coming years. Their reunion visit to Purdue culminated in a bus tour of campus. Congratulations to the Class of 1967! Click here to view photos of the reunion dinner taken by photographer Ed Lausch. At the login page, use the username "2017reunion" and the password "september2017". 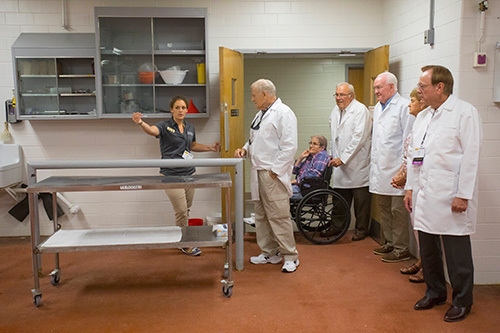 Alexis Zobel, of the DVM Class of 2018, leads a tour group from the Golden Anniversary Class of 1967 through the Large Animal Hospital. 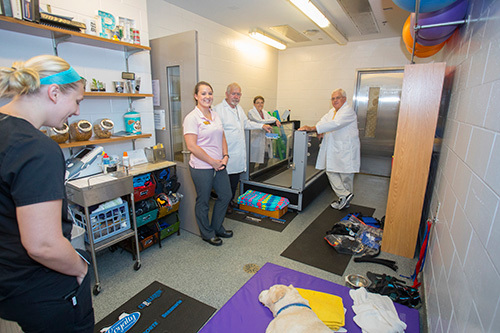 DVM Class of 2018 member, Sarah Dengler, shows her 50th Anniversary Class tour group the Physical Rehabilitation Service in the Small Animal Hospital, where they met Rehabilitation and Neurology Technician Jessica Bowditch, RVT.